Anyone who has been fortunate enough to visit France has undoubtedly had a taste of heaven that is the crepe. Not only in France, the birthplace of the crepe, but around the world, crepes can be found anywhere from a roadside stand to an upscale restaurant menu. Crepes are like extremely thin pancakes, and can be filled savory or sweet ingredients. My personal favorite is the crepe filled with Nutella. Crepes with Nutella can be served as a decadent breakfast among friends, or also a dessert to add the perfect finale to any meal. The nice thing about serving them as a dessert, is that they can be made early in the day, and warmed in the oven for about 10 minutes just before serving. This recipe makes about 24 small crepes (about 4 inches in diameter). I do not think I have ever make this recipe and had leftovers, somehow they all manage to get eaten every time. In a mixing bowl, combine the flour, salt, sugar and milk. Beat with a wooden spoon until ingredients have come together. Next add the eggs and melted butter. Continue to beat the mixture until a nice thin batter is formed. At this point you can refrigerate the batter for later use, or the crepes can be made right away. To make the crepes, place a medium sized nonstick skillet over medium heat for about 5 minutes. When the skillet is nice and hot, add a small drop of butter. Ladle about 1 ounce, or 2 tablespoons of batter into the skillet and swirl it around so that it forms a thin round disk. The batter will begin to dry in about 30 seconds. It will just slightly begin to take on a golden color. With a spatula flip it over, and let it cook for another 15 to 30 seconds. You do not want to crepes to get brown, so adjust the heat accordingly. At this point you can put the crepes aside for later use. I like to fill them with Nutella right away. Get a 9 by 13 inch glass baking dish, and grease generously with butter. Once your crepe is done, put a generous tablespoon of Nutella in the middle. (You can add more Nutella if you want additional gluttony.) Fold the crepe in half, and press lightly to make the Nutella spread. Then fold the crepe into quarters. Repeat with the remaining crepes. I usually fill the baking dish with six rows of four crepes each. If you plan to serve them later, cover and refrigerate. If you plan to serve your crepes right away, heat the oven to 400 degrees. Sprinkle the crepes with powdered sugar. Heat the crepes for about 10 minutes, then remove and serve right away. They are truly melt in your mouth delicious. ENJOY! People from all over the world come to Hawaii every year to admire the beauty and enjoy the charm of these wonderful Pacific islands. I certainly enjoy going there whenever possible and soak up the calm and relaxing effect that this place has on me. I noticed that every time I go there my whole persona relaxes and gets used to a nicer and slower pace. Red light lasts longer than 30 seconds? No problem ! Long lines at attractions? Enjoy the surroundings. Naturally, no traveling experience would be complete without having tried the local flavors. Obviously, the seafood is the way to go around here (but do not neglect short ribs when available). On a recent trip to Oahu, I enjoyed a beautifully prepared whole red snapper , fried, majestically decorated , garnished with a nice sweet pineapple sauce. The Mai Tai and the beautiful sunset did the rest. However, one of the most intriguing experiences that you certainly should not miss is having lunch at one of the famous shrimp trucks, widely available on the island of Oahu. We stopped on our way to Haleiwa and we found 3 or 4 of them close to each other. The one that was the most attractive ( and most crowded too) was Giovanni's Shrimp truck, a graffiti-covered white shrimp truck which is the oldest and one of the best known shrimp trucks on Oahu's North Shore. They are famous for their garlic shrimp , and they have plenty of garlic, ask your significant others the next morning...! I also enjoyed a nice hot dog, which tasted really good. I definitively recommend a stop to this suggestive place if you are in the proximity. Imagine yourself eating outdoors with a beer or margarita in hand, an ultra chilled dish of ceviche in front of you, tortilla chips on the side. With the hot days of summer upon us, ceviche is the perfect appetizer or even main course on a warm evening. No cooking required, and it's all make ahead. Ceviche is a seafood dish, consisting of raw seafood which marinates in citrus juice, usually lemon or lime. Most people believe that ceviche originates from Central or South America. Many countries and regions have their own special version. This particular recipe is similar to one that I have enjoyed in Mexico. 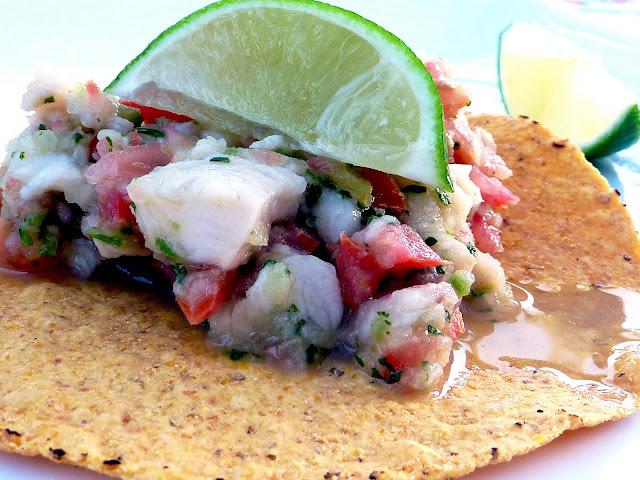 In Mexico, ceviche would most commonly be made with red snapper. I think it's best with a nice white fish, use whatever is the freshest that you have available. In my opinion, tilapia works great. The fish should marinate at least 4 hours before serving, but your best bet is to make it a day ahead. This way, the flavors are will blended, and you are sure that your fish has the texture you want, and is safe to eat. If you have a chopper, it's the way to go for this recipe, but if not, or you prefer to chop by hand, go for it! First you need to cut the fish into small pieces, like a centimeter dice. Put it all in the bottom of a large bowl. Next squeeze the juice from the limes (or lemon). Pour the juice over the fish and stir well. The juice should cover the fish, if it doesn't, then add more. Next add the tomato, onion, cilantro, serrano chiles, olive oil, and some salt to the bowl. Stir well. Your ceviche is now prepared, it just needs time to marinate. I recommend making it a day ahead of time, because I like the flavor of the end result better. If you must make and serve it on the same day, just be sure it is refrigerated at least 4 hours before serving. To serve the ceviche, place it in a serving bowl with tostadas or tortilla chips on the side. You can spoon the ceviche on the tostadas, or dip the chips if you prefer. If you want, wedges of avocado make a nice garnish. Your ceviche will be chilled, fresh, and delicious. You can enjoy it with a glass of white wine, but my personal faves would be a Cadillac margarita, or an icy cold beer. Buen Provecho! One of the greatest food experience anybody could have is to go to Italy or France and explore the huge variety of cheeses available. The appealing aspect of this adventure is that when you travel specifically through these two countries, languages, customs, and of course culinary traditions vary dramatically, even within small distances. In France , for example, the local fromagerie will always offer an endless and exquisite variety of cheeses, just stopping on one of these stores is a journey within your traveling. I grew up in Italy,and for me the flavor of cheese paired or mixed with other ingredients has always been part of the cuisine I was exposed to since I was born. For whatever reason, though, I was never particularly attracted to soft or very creamy cheeses, maybe because of the particular refined taste and texture that these cheeses offered. Now, however, there are very few of these cheeses, if any,that I don't enjoy, even on a daily basis. One of my favorite is the Robiola an Italian soft-ripened cheese of the stracchino family, made with varying proportions of cow’s, goat’s milk and sheep milk.Varieties of Robiola are produced across Piemonte and into Lombardia. It has a tangy taste, pungent smell and if one can overcome the smell, the taste is delectable. In this recipe the cheese will be wrapped with Bresaola, an air-dried salted beef, aged about three months , dark colored, very flavorful. Since Robiola is not widely available , you can substitute with creamy cheese of your choice available locally. 1/2lb of fresh Robiola cheese or other fresh creamy cheese of your choice. Take each bresaola slice, place a teaspoon of cheese and gently over the bresaola, without spreading.Gently roll the bresaola meat over the cheese so as to form a nice wrap. Do this with every piece of bresaola and the rest of the cheese. Before serving, gently sprinkle the wraps with some pepper and extra virgin olive oil. In the summer, when all of the best fruits are at the peak of their season, it is the ideal time to make a fresh fruit tart. This recipe is super versatile, because the best fruit to use is the ripest, sweetest fruit you have on hand. You can use peaches, plums, strawberries, apricots, grapes, whatever your favorite is. While traditionally a tart would be open faced, this one has a sort of a crumble on top. In my opinion, it just makes the tart that much more delicious. No jams, creams, glazes, etc., just fresh fruit and pastry goodness. Beautiful dessert, and also a tasty breakfast pastry if there is any leftover. While those who are super ambitious may choose to make there own puff pastry, I always use the frozen ready made puff pastry, and I find the results to be great, and the convenience can't be beat. This dessert is the ideal ending to a summer barbecue meal. 1 ready to bake puff pastry sheet, thawed at room temperature for about 40 minutes. Roll out the pastry dough when it is thawed, and spread it over a round tart pan. (Mine is about 11 inches in diameter, and the bottom comes out.) Completely cover the bottom of the pan with fresh fruit. Next make the crumble. In a mixing bowl, blend together the flour, sugar, butter, and pinch of salt until it becomes uniform and smooth like a dough. Crumble it in chunks over the top of the fruit. Bake the tart in an oven preheated to 400 degrees for approximately 45 minutes. Let cool before serving, I prefer it best at room temperature. Be sure to refrigerate any leftovers promptly. Enjoy!